Last week, Fr Paul wrote about the small change that will occur to the sending forth of ministers taking Communion to the sick. This change comes into effect next weekend. The intention is that this sending forth of ministers will now form a part of the blessing and dismissal rites at the end of Mass. We are all sent forth at the end of Mass to be the Body of Christ to our brothers and sisters and we, as a community, send forth those ministers to go out into the world to serve in a particular way. It is important that those taking Communion to the sick participate in this rite, and be entrusted with the Eucharist at the end of the Mass, rather than coming to request Communion from the tabernacle afterwards. There may be rare occasions where this is unavoidable. The practice of being sent forth from the Mass, however, is to be the norm in our parish. The practice of calling the ministers forward to receive Communion for the sick is not about drawing attention to those ministers. Rather, it is about drawing our attention to those who they will visit. We all have a responsibility to keep the sick and housebound of our parish in our thoughts and prayers. We should take the time to enquire occasionally about their ongoing health and offer support and assistance. Finally, we have a duty to ensure that we support those who care for the sick, and keep them in our thoughts and prayers as well. An important aspect of our pastoral care of each other is prayer for and outreach to our fellow parishioners who are unwell. It is heartening to see that many parishioners are certainly mindful of others who are unwell and assiduous in commending them to our prayers. A number of parishioners also take Holy Communion to those who are unwell. At times, spouses or other family members perform this service for each other. In other cases, a parishioner functions as a “Special Minister of the Eucharist” and takes Holy Communion to the sick who request it. Please be aware that either means of taking the Eucharist to the sick is appropriate and encouraged. If you would like to know more about providing the Eucharist to a sick family member or fellow parishioner, please speak about it to one of the Priests in the first instance. It is most desirable that those who take the Eucharist to the sick are seen to do so as an extension of the community’s celebration of the Eucharist and are commissioned by the worshipping community, through the Priest, at the end of Mass. This is why we have a special commissioning of Ministers of the Eucharist to the Sick at the end of Mass. To emphasise the link between the worshipping community’s celebration of the Eucharist and the taking of the Eucharist to the sick after Mass, we will be slightly repositioning when this commissioning takes place. Beginning from the Feast of the Body and Blood of Christ (the special feast in honour of the Eucharist) on the weekend of 21 & 22 June, Special Ministers of the Eucharist to the Sick will be commissioned after the Notices and the Prayer after Communion (rather than before, as is currently the case) – and immediately before the Final Blessing and Dismissal. These Ministers will be invited to process from the Church with the Priest and servers, as a way of symbolising that they are taking Holy Communion to the Sick as an extension of the community’s celebration of the Eucharist. You may have read last weekend in Carmel that we are looking to refine some of our procedures at Mass for those who are taking communion to the sick. 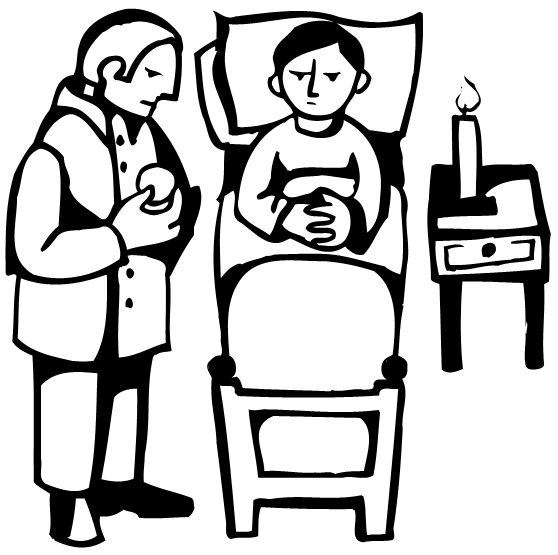 Communion of the Sick is one of a number of rituals that form the Church liturgical document Pastoral Care of the Sick. It also includes the sacrament of Anointing of the Sick, as well as Viaticum (which translates to “food for the journey) – the final communion one receives before passing from this life. As the name suggests, the whole purpose of Communion of the Sick is to ensure that those who are too ill to participate in Mass with the community are not denied the Body of Christ. It is a very practical an important way of our parish serving those that we know are in need. It provides the sick person with a continued link with their parish community, and helps them maintain a bond with the rest of us who are all parts of the Body of Christ. After communion, you will be asked to come forward to collect your pyx. You will be given a copy of the gospel reading of the day to use as part of your ministry of communion to the sick. You will also be sent forth with our warmest greetings and prayers for the sick person. In this way, we as a parish not only acknowledge your important ministry, but are made constantly aware of those people who are unwell and cannot be with us. Aware of this, we pray and hope that the time will soon come when they return to our midst.